Having survived last week’s polar vortex here in oh-so-chilly Chicago—and looking out at frozen shards floating atop Lake Michigan as we speak—I am, of course, eager for warmer days ahead. I mean...who wouldn’t be, at this point? 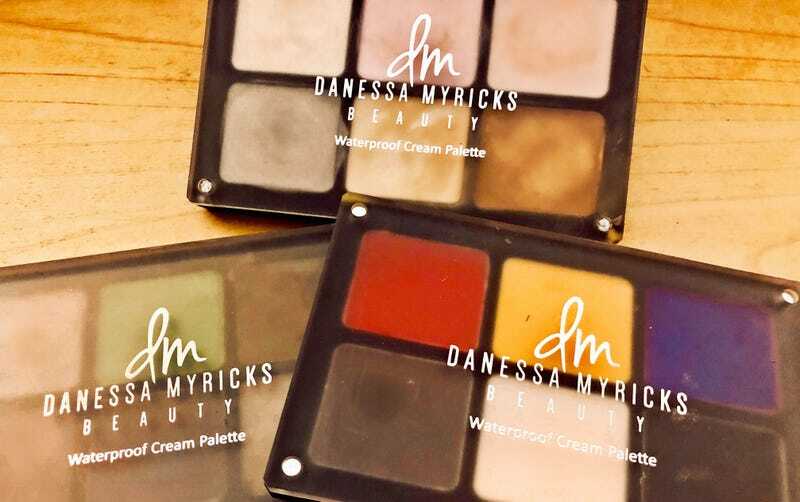 That said, since I can’t escape winter temps at the moment, on Day 6 of our Black-Owned Beauty Month challenge, I decided to lean into the soon-waning season with a deliciously frosty, snow bunny-inspired look using creme pigments from Danessa Myricks Beauty. Specifically, I dipped into Myricks’ Fire & Ice palette ($36), which includes six shimmery, pigment-rich frosts in a buildable, blendable cream-to-powder finish. Going for that strobe light effect, I applied the shade “Moonlight” on my lower lids, then layered “Supernova” and “Starlight” up to my browbone. I carried Starlight down to my inner eye and upper cheekbone, where I also threw on a little “Flame.” Because, why not? Then, I did a little reverse contouring by popping “Sunset” and “Sunrise” on my preferred highlight points—and to add a bit of depth and drama to the eye, I smudged a bit of “Get It Girl” from Myricks’ dynamic Future Is Female palette (also $36) on my outer corners and lower lashes. After applying a thin line of Fenty Beauty’s Flyliner in “Cuz I’m Black” ($20) and Beauty Bakerie’s Eyelash Icing waterproof mascara ($18; more on mascara to come), I gave my lips an equally frosted look with Myricks’ multi-use ColorFix Metallic Cream Color in “Romance” ($18). To add dimension, I layered it over her ColorFix 24-Hour Matte Color in “Rose Royal” (also $18). These are just a few of the products in Myrick’s extensive, full-spectrum, highly pigmented, makeup artist-beloved line. Stopping by to visit with The Glow Up last spring, she graciously gifted us with a sampling. While she was in our studio, she gave us some insight into how a non-linear career path led to following her passions as a makeup artist and beauty entrepreneur. Frankly, we have nothing but glowing reviews for both Myricks and her eponymous line—which is priced right for indulgence. Brown girl beauty and boss moves, too? This is what Black-Owned Beauty Month—and The Glow Up—are all about.